Iggy’s Bread IS my favorite bakery in town. Their breads and bread rolls are hearty and made of simple ingredients with no chemicals or preservatives (see comparison at end). My daily staple is their Whole wheat sourdough round, which goes well with Nutella, or even Trader Joe’s crunchy salty peanut butter and fruit preserves. 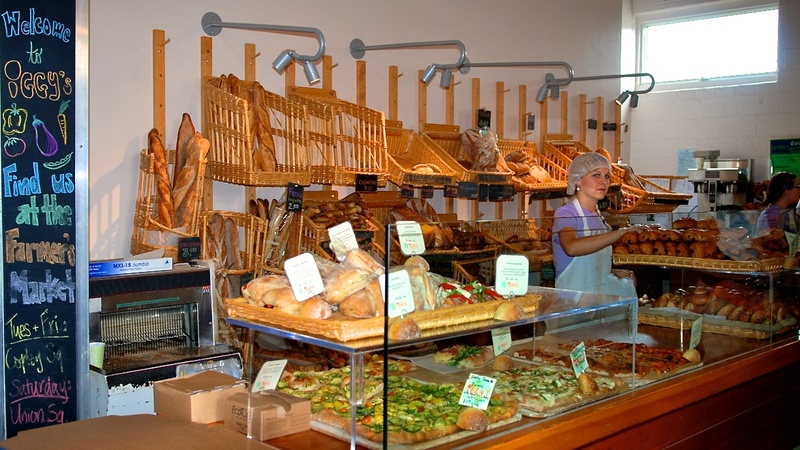 They also serve home made sandwiches and unique pizza creations, … and it is a beautiful store fronting their bakery. Compare ingredients in Iggy’s Bread and Pepperidge Farms Bread. How about some Chai with that bread? Good health,Thank your for sharing. Chris, thank you for sharing that. It is great to know that the wonderful people at Iggy’s use organic products, so much more reason to get breads and all the amazing creations from them. I bake my own bread in my bread machine. One of my favorites though is the No knead recipe form NY times. On my quest to reduce carbs, I stopped baking as much. I do experiment with spelt flour, buckwheat, barley, millet to cut down on wheat. We used to have a bread machine and ended up making “very calorie rich” breads. Then just stopped and gave away the machine. Now I rely on places like Iggy’s. Its amazing you are trying out all these wonderful varieties; must look around more for such smaller bakeries which can make specialty breads.